Early plans of going to the Stoke game were halted by my partner, she really didn't fancy celebrating 4 years of being together in Stoke! Anyway so a quick rearrangement of plans and we decided to spend a long weekend in Torquay, my only condition was we went to a hotel which had wifi for the saints game on the Saturday, we booked into the Imperial Hotel which had a balcony overlooking the sea, I really would recommend this place. Anyway kick off time came, iPad set up with a great stream, I ordered a beer from room service and sat in the unexpected warm sunshine to watch the game on the balcony. Saints came into the game on the back of 3 poor results, the season looked like it was just going to drift away to a mid table finish, with Fonte out, Koeman ignored the obvious choice of bringing in Yoshida and opted to move Bertrand to centre back and bring in Targett at left back. Both sides started the game with sloppy passing, Stoke had a good chance Bertrand did well to intercept, then Saints gained control. After ten minutes, Long picked out Pellè, who's great header was tipped over the bar by Butland in the Stoke goal. A great save, from the resulting corner from Davis. Pellè then made a great run to lose his marker to head past Butland, Stoke 0 Saints 1. A few moments later Martina played a great long ball to pick out Long. He bought a fine save by Butland and Saints seemed well in control. After this Stoke had a long period of possession, without actually creating anything. Saints always looked under control and dangerous on the break. It was no real surprise after 30 minutes when Saints doubled the lead. Pellè on the left hand side played the ball to Tadić, who did well to hold the ball whilst Pellè made his move into the box. Tadić played the ball back to him and Pellè curled the ball round Butland and into the far corner of the net. Stoke 0 Saints 2. Stoke made a substitution after the goal but it had little effect. Although they had a lot of possession, it was still Saints who looked the most likely to score. Long making terrific runs was terrifying the Stoke defence. On the stroke of half time Saints should have scored a 3rd, Long passed to Tadić who was unmarked in the box. It seemed a simple chance, but he took a touch when he should have shot, and a Stoke defender prevented the certain goal. The second half started with Stoke trying to get an early reply and after 52 minutes Stoke got it. Arnautovic got in front of Van Dijk to flick the ball in. 1-2. For the next 20 minutes Stoke were all over Saints, with the away team struggling to get out of their own half. Saints defended superbly, but the counter attacking game had gone and it was no surprise on 70 minutes when Koeman made a change, Ward Prowse on for Classie who had worked so hard, he looked physically drained. 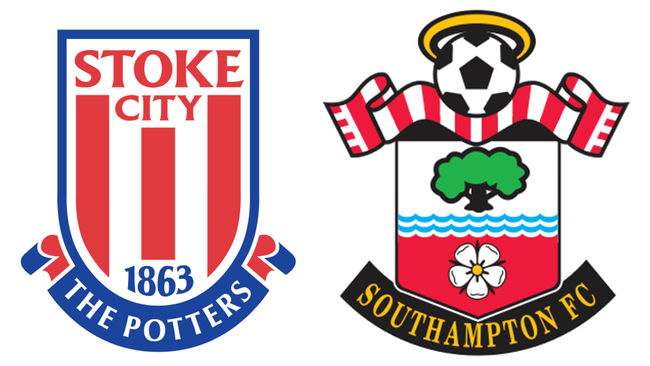 The substitution worked well and Saints started to look dangerous again with several good chances. On 70 minutes the ref who'd had a good game so far, failed to give a clear cut penalty, Tadić was completely taken out by Butland, we will never know why the penalty wasn't given, it was so blatant. Tadić was then replaced by Mané and Stoke bought on Peter Crouch. Stoke started pumping aimless balls up front, not really causing any real danger. On 87 minutes Saints were given a free kick 25 yards out. Ward-Prowse took a great shot and Butland was well beaten, but unfortunately the ball hit the cross bar.